Taiwan-made auto repair tools enjoy high popularity among professionals for competitive price and excellent quality. Living up to Taiwan's reputation of “Kingdom of Hand Tools” in the world, suppliers of auto repair tools on the island have also earned great compliments for their longtime dedication to capability upgrades in R&D and branding. Unwilling to compromise to overwhelming challenges of rivals in emerging countries and realizing that a fierce global competition in prices may erode their influence in the market, most Taiwanese suppliers of auto repair tools have actively tried to go upmarket, in efforts to redefine their positions in the line via such a tried-and-taken strategy. One supplier said that it was very common to see Taiwan-made products were taunted by foreign users as products of poor quality in movies, or real life; however, Taiwanese suppliers are now proud of “made-in-Taiwan” trademarks, as the notorious stereotype has been dispelled thanks to insiders' hard work. One notable supplier of this kind is Years Way International Co., Ltd., who turns out various air tools for auto repair and professional use with global reputations. With more than 30 years of experience, the company has is a time-tested maker of its kind on the island, supplying varieties of pneumatic tools, including air spray guns, impact wrenches, air sockets, air ratchet wrenches, air tackers, air staple guns, air nailing tools, pneumatic grinders, pneumatic buffers, pneumatic stripping tools, etc., all of which have been tested for CE and national standards worldwide. Also, the company provides OEM (original equipment manufacturing) and ODM services. Pointing out customer relationship, Wang mentioned that the company's sales this year have quickly recovered to the before-financial-tsunami level, mainly because old customers in Korea, Russia, Egypt, Belgium and France have come back for placements of orders with the company. This attests to the company's better customer relationship management based on computer technologies. Wang also introduced his company's newest product, Professional Air Impact Wrench, which is as light as a 1/2” air impact wrench, and generates as high torque force as a 3/4” model. Besides, he added, the comparatively lightweight wrench is housed with high-strength aluminum alloy and built with an improved motor system to outperform competing models. The anvil of the tool is made of alloy steel going through special heat treatment for unbeatable durability, while a rear exhaust system is designed to allow the tool to exhaust through the handle and keep air away from users. The high-profile tool, also available in an impact socket set, is ideal for vehicle, truck and boat maintenance. “In fact, we have also marketed our products under owned brand Yearsway for years, and successfully built overseas footholds in several countries,” Wang said. “This is attributable to our computer-aided management, R&D capability and commitment to customer's trust.” He religiously believes Taiwan-made air tools are globally competitive on the basis of prices and quality, because they averagely sell for only one-third or one-fourth prices of competing models made by U.S. and Japanese makers, but are comparable with those in quality and performance. Founded in 1988 in Taichung County, central Taiwan, A-Kraft Tools Manufacturing Co., Ltd. is also an efficient manufacturer of hand tools for DIY and auto repair purposes with world-caliber management capability. 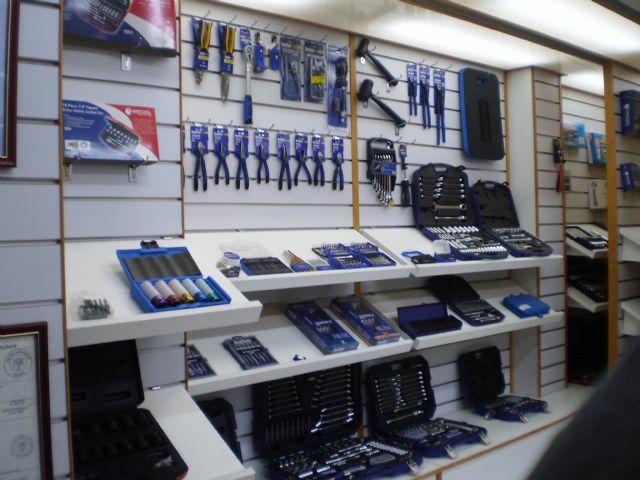 The company supplies a wide range of auto repair tools, including sockets, socket accessories and sets, socket wrenches, ratchet handles and combination wrenches for cars, heavy-duty vehicles and machinery, and a variety of hand tools, such as screwdrivers, bit sets, pliers, tool cabinets and tool sets, 80% of which have been recognized by professional users especially in Europe. Around 30% of the company's products are exported on an OBM (original band manufacturing) basis and the remainder on OEM. Few in the line can compare with A-Kraft in achievements in carrying out fully computerized organization and production management. The company's chairman Louis Chen sees the competitive advantages key to his company's sustainable developments. Among the company's proudest MIS is CARS (Computer Automated Reminding System), which Chen said has been officially recognized in 2010 as an ideal solution to sharply raise management efficiency from routine paperwork to production and inventory control. The system is independently developed by the company's software engineers and coordinated to a huge-capacity database constructed in house, able to provide each worker and director in the company with updated information related to their respective tasks, and help the company with worker performance evaluation. Chen introduced that the system automatically mails purchasing agents, stock keepers and delivery workers, for example, as the remainder day by day until they report their jobs done back to the system, while simultaneously reporting feedbacks from workers to directors in every stage of work underway. Any awardable or poor performance by workers will be recorded by the system in the form of day numbers advancing or delaying required deadlines, and stored in the database, which, in turn, can help directors to evaluate subordinates' performance at the end of a year. Application of information management systems in assembly and package lines at the factory also enables the company to serve as a logistics center for customers who operates outlets in different places. Chen indicated that his company employs conveyor belt systems coupled with the CARS to help customers with pre-delivery shipment organization and destination arrangement. The logistical operation that facilitates movement of customer's ordered products to enhance value-added efficiency is also part of Chen's One-stop All Services.